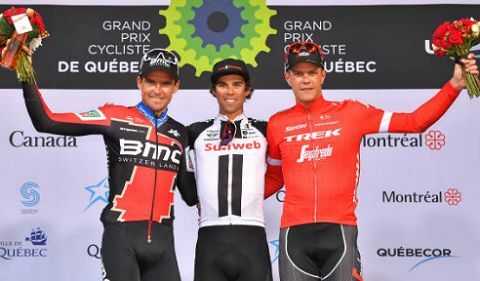 The top step of the podium at the Grand Prix Cycliste de Quebec continued to provide elusive for Greg Van Avermaet, who today claimed second place at the race for the third consecutive year. Attacks started as soon as the peloton rolled out for 16 laps of the 12.6 kilometer course and immediately five riders went clear. The peloton, evidently happy with the formation of the breakaway, sat up and allowed the group to go six minutes down the road. With Van Avermaet as one of the pre-race favorites, BMC Racing Team hit the front of the peloton to control the race and allowed the breakaway to maintain their six-minute advantage for the first 100 kilometers of the 201.6km kilometer course. Team Sunweb and Astana Pro Team contributed to the chase and with five laps remaining, the peloton started to pick up the pace to bring the breakaway back. The breakaway’s advantage had been halved to three minutes with four laps to go and by the time they passed the finish line for the last two laps, the breakaway had split and Pete Kennaugh (Bora-hansgrohe) launched the first attack from the bunch. Kennaugh passed under the finish line on the bell lap with a narrow advantage while behind, Michael Schär hit the front of the peloton to bring back a six-rider chase group that has established between Kennaugh and the bunch. On the last lap, Kennaugh managed to hold a 20-second lead until the final two kilometers when the favorites started to close in at the top of the climb and had him in their sights. Van Avermaet hit the front under the flamme rouge and with 300 meters to go, at which point Kennaugh was caught, the Belgian launched his sprint. Matthews managed to come over the top of Van Avermaet in the final meters of the race which saw Van Avermaet settle for second place for the third consecutive year and his fifth podium result at the race. Top 3: 1. Michael Matthews (Team Sunweb), 2. Greg Van Avermaet (BMC Racing Team), 3. Jasper Steven (Trek-Segafredo).